Keeping a home maintained is no small task. It requires care and detailed attention. Sometimes it's necessary to hire a handyman to get a particularly challenging job done. If you find it difficult to complete renovations and repairs by yourself, or if such tasks are eating up all your time, contact Sears Handyman Services for help. Sears Handyman Services technicians are trained in a wide variety of home improvement and home maintenance tasks. From building decks to general plumbing, our technicians are capable of assisting you with all your minor to intermediate home repairs. Give us a call at (973) 586-5131. Minor electrical problems don't always require the attention of a professional electrician. It may be too tricky for a homeowner to complete, however, Sears Handyman Services are available to take care of all your minor electrical repairs. We can install LED and recessed lighting and repair or replace ceiling fans and other lighting fixtures. If you need help with these tasks and more, contact us today. A common material used in today's construction is drywall, and many homes will have it. It's a reliable material because it's sturdy and portable. But be careful not to hit it too hard with something like a door handle because it may break. Additionally, unsightly holes from nails are sometimes a problem. For major or minor drywall repair, call Sears Handyman Services. We can repair, hang, patch, and tape drywall. Our experienced technicians are equally adept at working with new material as they are working with existing drywall. Spending time outside on the deck with family on a summer day is a great way to enjoy the outdoors. While decks are a wonderful addition on any home, they take considerable effort and time to maintain. Let Sears Handyman Services maintain, repair, or even build your new deck from scratch. Our technicians can fix decks with damage caused by wood rot, replace and repair loose boards, prevent water damage with deck staining, and more. To mark your property line, create some much-needed privacy, and enclose your yard, consider installing a fence. Improve your home's aesthetics with a picket or privacy fence with the help of Sears Handyman Services. For a more economic option, ask about a chain link fence. Our handymen will help you with all your fencing needs. Bring your home back to life with a brand new paint job. Painting and removing wallpaper has the potential to take up a lot of your time and can seem like a chore. It may also be hard for some people to climb ladders to reach high walls and ceilings. 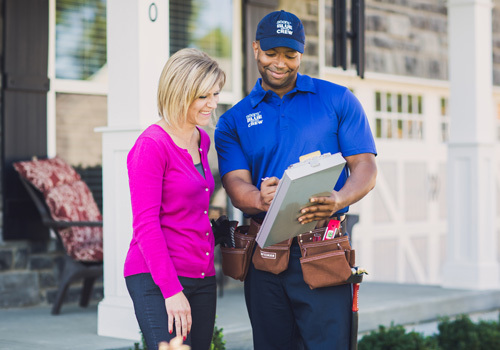 To save you the hassle, Sears Handyman Services can help. For these jobs and more, contact our qualified handymen to get the inside and outside of your home looking fresh and new.